Our London chauffeur services Range Rover Autobiography LWB… What a Luxury 4×4 SUV. She is with a 4.4 litre V8 producing 340bhp under the bonnet and sitting on 23” Alloy wheels. Now that’s enough of the Motor Magazine style of car description. Let’s take a look what you, “the passenger” can expect. On opening the doors and taking your seat inside the Autobiography you will feel like you have just stepped into and been seated in a private jet and will be impressed by the elegance of the cream leather interior. As this is the Long Wheel Base version of the Range Rover Autobiography there is plenty of room in the rear to stretch out. Even if you are like myself over 6ft tall there is space to comfortably seat 3 passengers in the rear. The front and back seats are reclinable, heated and ventilated. Passengers in the rear also have duel control air conditioning, a cool box for storing their refreshments and two large HD entertainment screens. The full-length panoramic sunroof also makes the cabin feel light and spacious. Outside the windows are tinted for your privacy. For such a large and imposing SUV the Range Rover Autobiography is as much at home driving in and around London, going for evening out at the Royal Albert Hall as it is taking your guests for a country house weekend. Making it a true all round luxury vehicle. We recently provided some overseas clients with the Range Rover Autobiography along with a Mercedes V Class (People Carrier) and two of our chauffeur drivers. They spent the next ten days on a sightseeing tour of Great Britain taking in the Cotswolds, the Midlands to visit Shakespeare’s birth place, the Lake District across to Edinburgh in Scotland. From here they came down to the Cathedral Cities of Durham and York before finally passing through Cambridge on their way back to London. 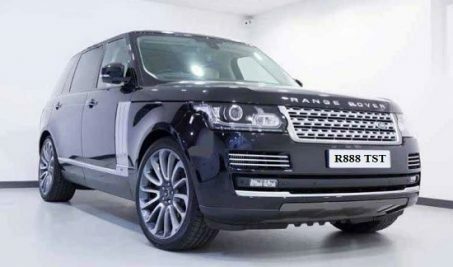 We can see our London chauffeur services Range Rover Autobiography proving to be a popular vehicle with clients and can see it as ideal for you and your guests to go to the horseracing festivals at Cheltenham, The Epsom Derby, Royal Ascot and Goodwood. Or perhaps you can imagine being chauffeur driven to the Guards Polo Club Windsor to go watch one of the weekend chukkas. For whatever trip you have in mind rest assured our London chauffeur services Range Rover Autobiography will not disappoint. If you would like to book the services of one our Range Rover Autobiography Long Wheel Base SUV’s along with one of our chauffeurs please feel free to email us or feel free to give us a call on 020 7409 3033 where we will be happy to help with your travel requirements.